The My Community Application Toolkit is designed to help local leaders and decision makers from communities not included in the Fitness Index rankings. The toolkit enables local leaders to assess their own community fitness, and build understanding of the individual and societal behaviors related to physical activity in their community. 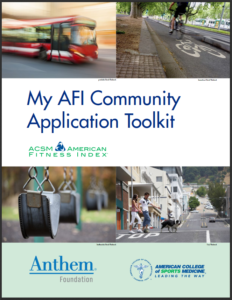 Download the toolkit here and share how you’re using the toolkit at afi@acsm.org, Facebook, or Twitter using #100FitCities.